In honor of the opening day of the State Fair of Texas, our media partners at The Dallas Morning News, along with Shoot Low Sheriff, have reworked the "State Fair Romp," a tune about the annual fair set to "The Yellow Rose of Texas." We received the song on the fair's opening day. We played it for NBC 5 Chief Meteorologist David Finfrock when he arrived for work in his hat and denim, ready for his live shots at The State Fair of Texas. What happened next had to be seen to be believed. 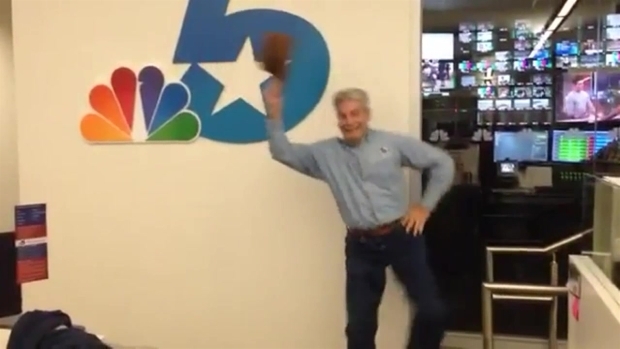 Upon hearing The Dallas Morning News' "State Fair Romp" NBC 5 Chief Meteorologist David Finfrock broke out in dance. Finfrock's State Fair Romp Stomp isn't his first foray into dancing. We learned that he had moves in 2009 when a photo that we all believed was Photoshopped was sent in to isee@nbcdfw.com. David Finfrock busts a move on the dance floor. We later learned Finfrock indeed stepped up to perform a Russian folk dance during Holly Potter-Harvey's wedding reception. We can't wait to see what dance our Weather Expert will do next. Stay tuned, we'll be sure to post about it here on NBCDFW.com. Note: He's averaging one every five years, although we get treated to his dancing abilities at our company holiday party every year.